Every society is endowed with resources that are used to produce the goods and services that enable it to survive and prosper. 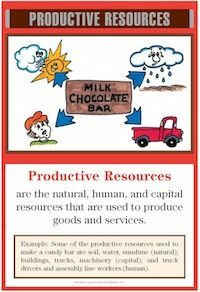 These resources, called productive resources, are often classified into three groups: natural resources, human resources, and capital resources. Natural resources (often called land) refer to resources such as coal, water, trees, and land itself. Raw materials used in production come from natural resources. Human resources (labor) describe the human work effort, both physical and mental, expended in production. Capital resources are the man-made physical resources (such as buildings, tools, machines, and equipment) used in production. People also have different levels of income to purchase economic wants. Obviously, people with higher levels of income can purchase more goods and services or can take more leisure time. Regardless of their income, however, all people must choose to satisfy some wants, but not others. The desire for more goods, services, or leisure time is not necessarily "greedy." People often want more so they can give more to others in need; provide a better life for themselves, their children, or aged parents; or make their neighborhoods more beautiful. In many elementary textbooks, a distinction is often made between wants and needs. However, the concept of needs can be very subjective, and economists typically lump both terms together under the general category of wants. Identify and categorize examples of productive resources used to produce a good or service. Use modeling clay to represent these resources. Draw pictures representing a capital good used to produce a good or service in the school or community. Use the pictures to make a bulletin board. Use a resource map of your state to locate natural resources. Cut out pictures from a magazine illustrating different types of jobs. List the educational and skill requirements for those jobs. Bring to class examples of capital goods used in the home. Discuss how these make family members more productive. Write a critical essay or paragraph entitled, "Why Countries are Rich or Poor." Mention factors such as the quality and quantity of the various productive resources. List and discuss ways students can improve their skills and abilities, like their human capital. Identify specific places in the community where students can increase their skills (schools, apprenticeship programs, evening training opportunities, on-the-job training, community center seminars, private lessons, studying books in the library, etc.). Create a bulletin board illustrating how capital resources have changed over the years. Students can choose a specific industry to emphasize. Create a resume, listing human capital such as skills, education, personal strengths, and abilities. Design a brochure advertising the natural, human, and capital resources of the community, region, or state to encourage businesses and families to locate there. Students could design brochures representing various historical periods.